Support your loved one with this great Personalized Epilepsy Awareness T-Shirt, whether it’s your Child, Grandchild, Sister, Brother, Friend or any loved one you know battling with Epilepsy. With any Epilepsy Awareness Walk Event, you along with family and friends can show your support and help raise awareness together. Our Personalized Epilepsy Awareness T-Shirt is available on our premium 100% cotton Black T-Shirt or our 100% cotton White T-Shirt, machine washable in youth sizes XS-L and adult sizes S-3XL. Includes FREE Personalization! 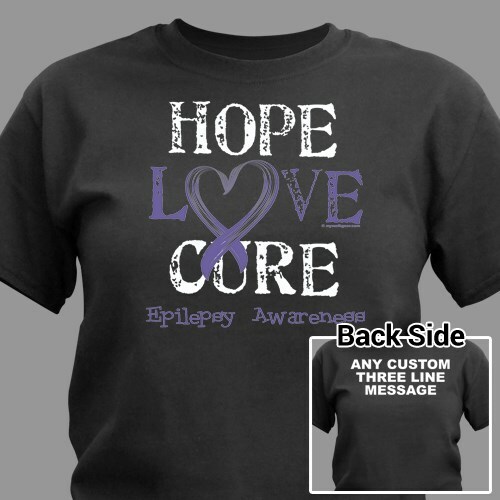 Personalized your Epilepsy Awareness Shirt with any three line custom message on the back. I love the design for the shirt and how proceeds goes towards a disease u choose!!!! Love this site!!!! Additional Info By showing awareness, you will help support Epilepsy and also help fund research for a cure. Wear this Personalized Epilepsy Awareness T-Shirt and our Personalized Epilepsy Awareness Hat at your next Walk Event. Be sure to also bring along our Personalized Epilepsy Water Bottle to show your community who you are walking for. For all your Personalized Epilepsy Shirts and Walk Gear, shop MyWalkGear.com today.